Dr. Nim was made by John Godfrey, the same person who designed the original Digi-Comp II. His grandson, Andrew Beck, has the Dr. Nim prototypes and recently shared pictures and video of them via twitter. The second prototype still works, and he shows off how the mechanism works in the video, along with pointing out some of the differences between the two prototypes. The earlier prototype has switches that look very similar to the ones in the Digi-Comp II. The second prototype is very close to the production version, which we blogged about some time ago, and can be seen below. Thank you, Andrew, for sharing this bit of history! This entry was posted in Vintage Technology and tagged digi-comp II. Bookmark the Permalink. YouTube user Richard Lewis built a working replica of the Digi-Comp II mechanical computer in the sandbox video game Terraria. The replica makes extensive use of the so-called “Hoik glitch” in the game, that allows for rapid, controlled player movement, much like gravity guides the balls downward in the original. More information about the version in Terraria is posted on the video page. This entry was posted in Engineering, Mathematics, Software and tagged ALU, digi-comp II, games. Bookmark the Permalink. …it’s amazing that such a simple contraption of balls and toggles could already take us over the threshold of universality. Universality would immediately explain why the Digi-Comp is capable of multiplication, division, sorting, and so on. If, on the other hand, we don’t have universality, that too is extremely interesting—for we’d then face the challenge of explaining how the Digi-Comp can do so many things without being universal. This entry was posted in EMSL Projects, Mathematics, Vintage Technology and tagged computer science, digi-comp II. Bookmark the Permalink. Addie and Whisker of @tymkrs just posted video from their recent epic road trip including a visit to our shop. The video starts off in Colorado and wends through Arizona before getting to the bay area. After stops including the Internet Archive, the Electronics Flea Market and HSC, they arrive to tour our shop (starting at 11:53) before wrapping up at Tindie. We had a great time talking about the Eggbot, WaterColorBot, Digi-Comp II and miscellaneous vintage mechanical and electronic contraptions. This entry was posted in Field Trips and tagged digi-comp II, eggbot, road trip, vintage tech, watercolorbot. Bookmark the Permalink. Kids found 1966 ‘computer’ ‘game’ in the closet and LOVE it. Dr. Nim always wins. Our future may be OK.
We were on a week long vacation in Michigan. We rented a large house on the shore of Lake Michigan near Traverse City. The house looked like an extreme example of 1960’s decorating—nothing has been updated since. (Large tables with built-in ash trays, shag carpet, an old radio that had a “magic eye” that lit up when your FM radio station was ‘in hi-fi stereo’, etc.) 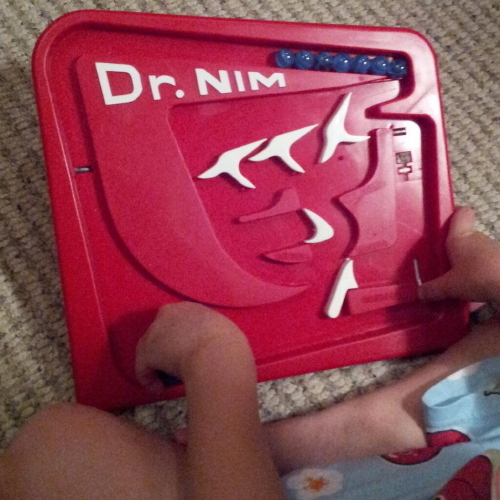 And, in the closet with the games, was one called Dr. Nim. Us adults never gave it a second glance until one of the older kids noticed that it said “computer” on it, and pulled it out to see if she could get on Facebook with it. My ears perked up, and when I saw the front cover, I couldn’t stop playing with it. Which is not surprising considering my background as an embedded systems engineer. But what I couldn’t believe is that the kids loved it too! We were on vacation with 2 other families, each of which had 3 kids (like ours) of various ages. Very quickly, the 10 year old figured out how to beat Dr. Nim. Of course that made all the other kids want to try. Even the 4 year old learned to play. And then some of the other adults (even non-engineers) tried it for themselves, asking how it could possibly know how many marbles to take each turn so that it would (almost) always win. “How can pieces of plastic be a computer?” they asked. So we had a nice chat about where the term ‘computer’ comes from. The thing that got me most excited was not that (modern) kids picked it up and were fascinated by it, nor that other adults were intrigued, but the thought that, in 1968 when it was available for sale to the general public, enough normal Americans bought it that it ended up in people’s game closets along with decks of cards and Monopoly. 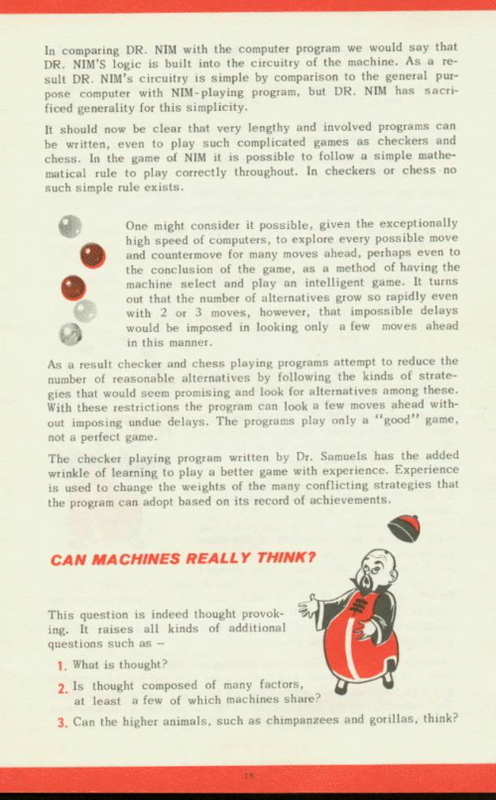 I suppose the thought of owning a ‘computer’ when such things were all the rage, was so new that spending a few dollars on a plastic mechanical game computer was something a lot of people did just out of curiosity. And the instruction manual! I should have scanned it in. It has a mini-course in binary logic and boolean equations, ending with a discussion on how the game works, and how you can set it up in several different ways to play different games. And then it went on with “does this mean Dr. Nim can think?” and the open ended questions of machine thinking. The strides that man has made in the last 15 years in developing machines that extend and supplement his thinking are truly astounding. Who can say what enormous strides will take place in the next 15 to 30 years? This entry was posted in Vintage Technology and tagged digi-comp II, games, vintage tech. Bookmark the Permalink. I just wanted you and the entire Evil Mad Scientist team to know that the Digi-Comp II was a big success. I used it to explain digital computers to a group of second graders and fifth graders. In an age of iPads and smartphones, it’s surprisingly hard to demonstrate the beauty and magic of digital computer. The Digi-Comp II was perfect, looked great, and worked flawlessly. Thanks! This entry was posted in Education, Electronics, Engineering, Vintage Technology and tagged digi-comp II. Bookmark the Permalink. In anticipation of the upcoming father’s day holiday, we’ve put together a little gift guide with selections from our store. We’re also putting all of these items on sale now through June 12: just enter coupon code “VADER” in the shopping cart to receive 10% off. First up is the Digi-Comp II, First Edition. It’s perfect for teaching the basics of binary math to kids and parents alike. 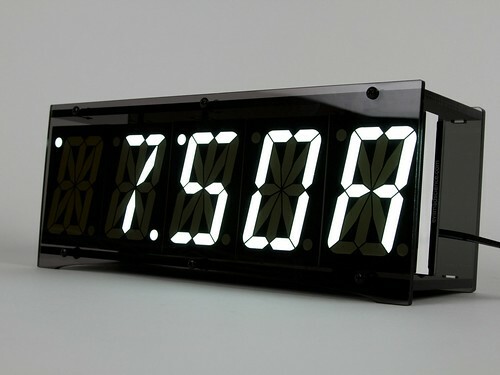 The Alpha Clock Five kit, in original Red Edition, the gleaming White Edition, or the brand-new Blue Edition, is the perfect clock for the discerning hobbyist. It’s eminently hackable and full-featured, with digits big enough to see across even the largest of garages or just next to the bed before you put your glasses on. For someone expanding their electronic horizons, or working a ton of projects at once, our Diavolino Starter Packs, and AVR Starter Packs will keep them happily busy. 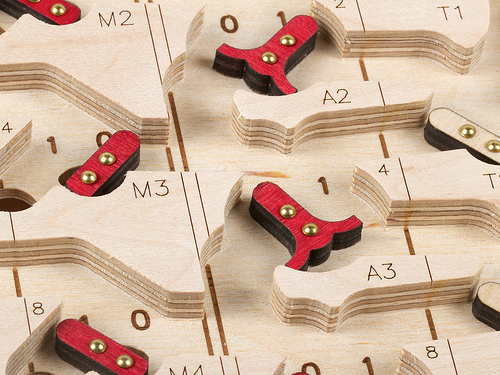 Our Octolively Modules would make an excellent addition to a furniture or remodeling project. 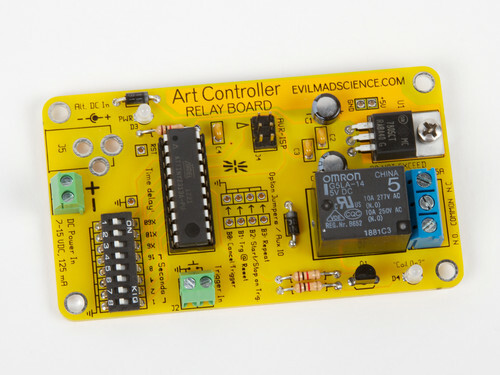 The Art Controller is a modern take on an old classic, perfect for someone with plenty of project ideas who just needs an occasional trigger. Tools are always a great gift choice, and anyone would be proud to own our ESD-Safe Screwdriver Sets. 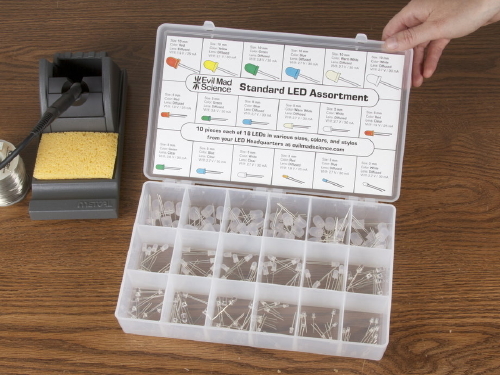 Another great workbench addition would be our Standard LED Assortment. 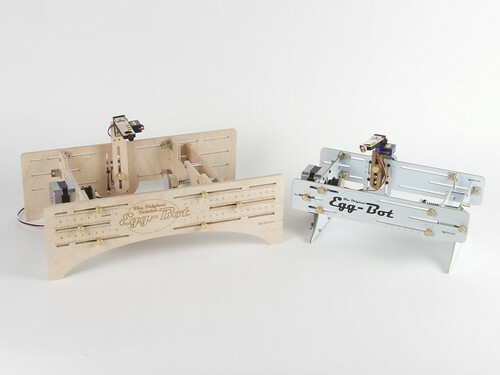 The Egg-Bot started out as a way for one father used to show his family how cool it could be to play with stepper motors. Both The Original Egg-Bot Kit and the Ostrich Egg-bot are on sale. The father’s day sale runs through June 12: enter coupon code “VADER” in the shopping cart to receive 10% off these items. 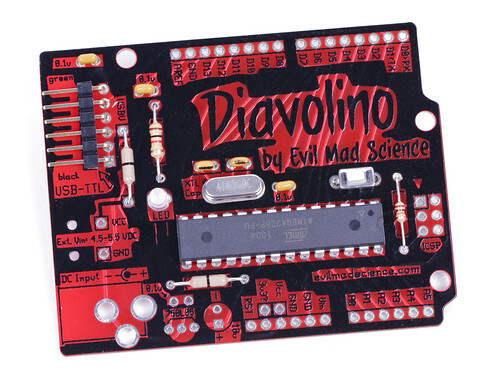 This entry was posted in Evil Mad Scientist Shop and tagged alpha clock five, art controller, diavolino, digi-comp II, eggbot, holiday, octolively. Bookmark the Permalink. 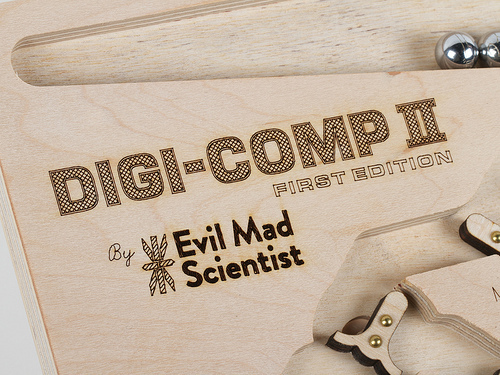 We recently announced availability of our “first edition” wooden Digi-Comp II kits. These are big kits, and there are a variety of different manufacturing steps and processes— from CNC routing to vacuum forming —that have somehow found their way into the build. In this little photo essay, we’ll show you just what goes into the making of the Digi-Comp II, First Edition. 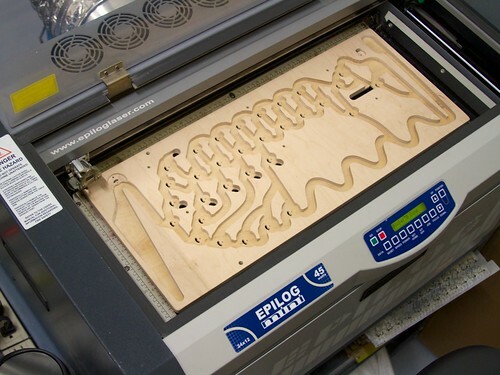 This entry was posted in EMSL Projects and tagged cnc router, digi-comp II, laser cutter, vacuum former. Bookmark the Permalink. We’re pleased to finally announce availability of our brand new, long-awaited kit, the Digi-Comp II: First Edition. 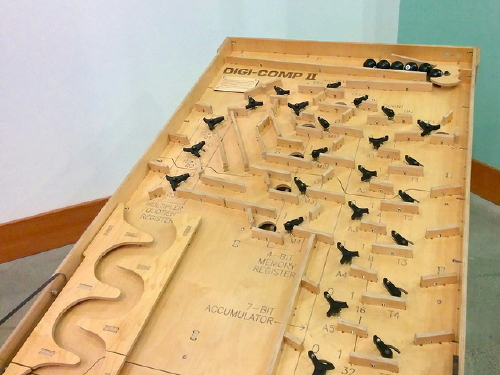 It’s a modern, fully-operational recreation of the original Digi-Comp II— the classic 1960?s educational computer kit —CNC routed from hardwood plywood. The Digi-Comp II is a binary digital mechanical computer, capable of conducting basic operations like adding, multiplying, subtracting, dividing, counting, and so forth. These operations are all conducted by the action of balls rolling down a slope, directed by mechanical switches and flip flops, and all powered by gravity. We’ve been working on project for over two years now, and so we’ve written before, in some detail, about how the Digi-Comp II works, and what kinds of things you can do with it. 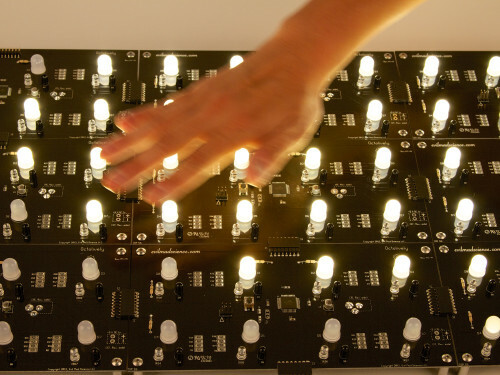 We’ve written about our larger than life version of the Digi-Comp II, which uses 8 Balls. We showed off that version at the 2011 and 2012 Bay Area Maker Faires and made a demonstration video to show how it works. 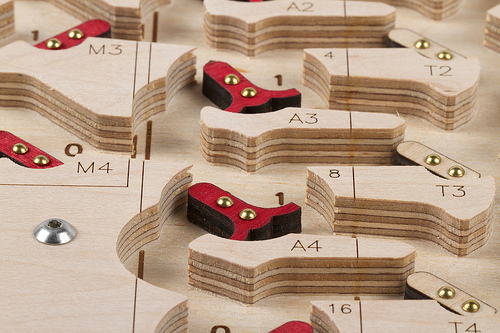 We have also written about our smaller wooden prototypes that we displayed at the 2011 Maker Faire New York. Our new version, the “First Edition,” is a descendent of the latter. As compared to the “2011” model, it has a huge number of refinements— including an improved ball feeder that both fits 30 balls at a time (so you don’t need to refill during most calculations) and is jam resistant, a more compact and reliable start lever, better labeling, better flip-flop design, and internal baffles that slow the balls down, to prevent them from flying out of the machine. Many of these improvements were made possible by slightly reducing the size of the balls that we use. Whereas the “2011” model used ½” ball bearings, the First Edition uses standard 11 mm pachinko balls, which are easily available, shiny, and rust resistant. The fact that they are slightly smaller has allowed us to shrink some of the main circuitry, to allow for that larger ball feeder, to use thinner flip flops, and to fit the full machine into the same 10×24″ envelope that we had aimed for, which is considerably more compact than the 14×28.5″ size of the original. You may notice that the laser marks are very sharp on the “mesas” of the playfield, and less sharp but more bold down below. This is an intentional effect, created by laser engraving the playfield in a single pass, with the laser focussed just below the level of the “mesas.” On previous versions, we’ve either lasered the two parts independently, fully in focus at each depth, or focussed the laser halfway between the top and bottom— which leaves the engraving to look uniform, but less sharp, at each depth. But this method seems to create exactly what we want: sharp up top where it’s easier to read, and bold down below where it’s harder to see. 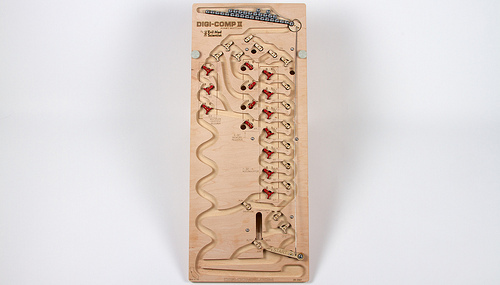 The playfield itself is made of 1/2″ thick maple-faced veneer-core all-hardwood plywood. This is a rock-solid material that is about as far from “hardware store” plywood as you can imagine. We use a CNC router to cut the pivot and limit holes for the flip flops and to carve the channels— roughly 3/8″ deep —where the balls can roll. The CNC router is precise enough that when we cut the channels for the balls, we evenly split one of the veneer layers, ending up with a clean inner surface. 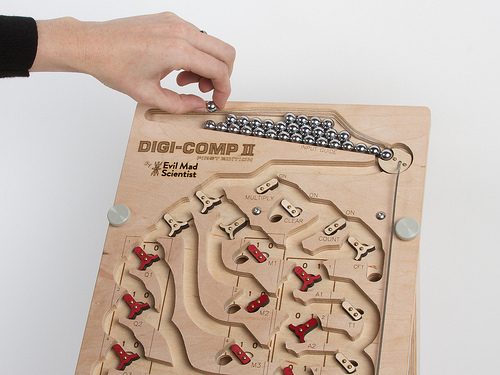 The Digi-Comp II also has a lower deck, below the playfield, that supports the clear-register and complement functions. The lower deck is carved in the same way, but does not have any laser engraving. The lower deck is attached below the upper deck by six screws that come down from the top to meet six wing nuts below. Between the two layers are 3/16″ spacers that keep the decks uniformly separated. It turns out that it’s actually important to use six screws; our earlier prototypes tended to jam up when the spacing between the two layers wasn’t controlled well enough. One of the other improvements is that the “First Edition” kit has a very sturdy stand, as shown above. 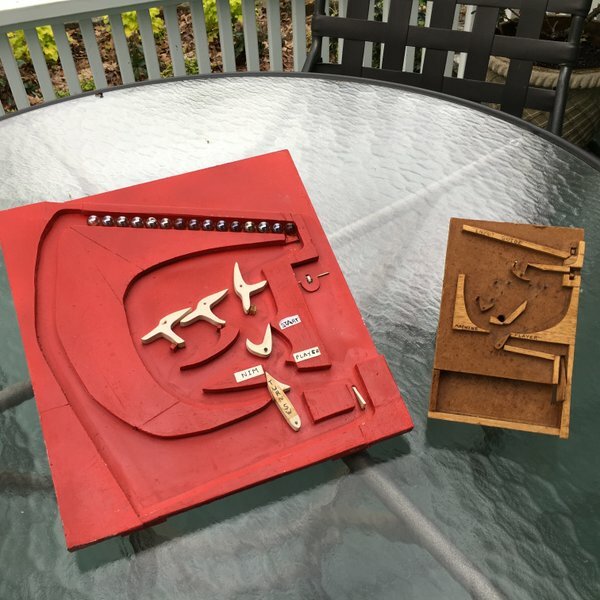 The laser-cut stand on the “2011” model was flimsy, and the simple dowels on the original 1960’s kit were not much better. 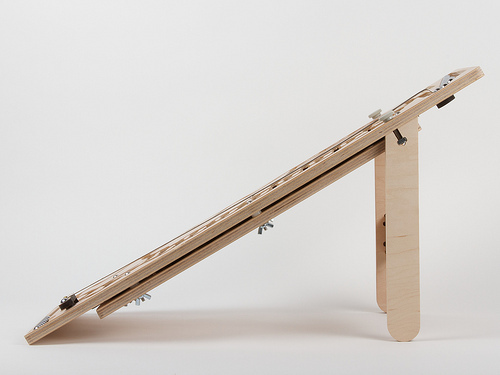 The new stand is a glued assembly made of two rigid legs and a crossbeam, made of the same remarkably-hard plywood as the rest of the machine. It can be attached to or detached from the playfield with the two fat thumbscrews. 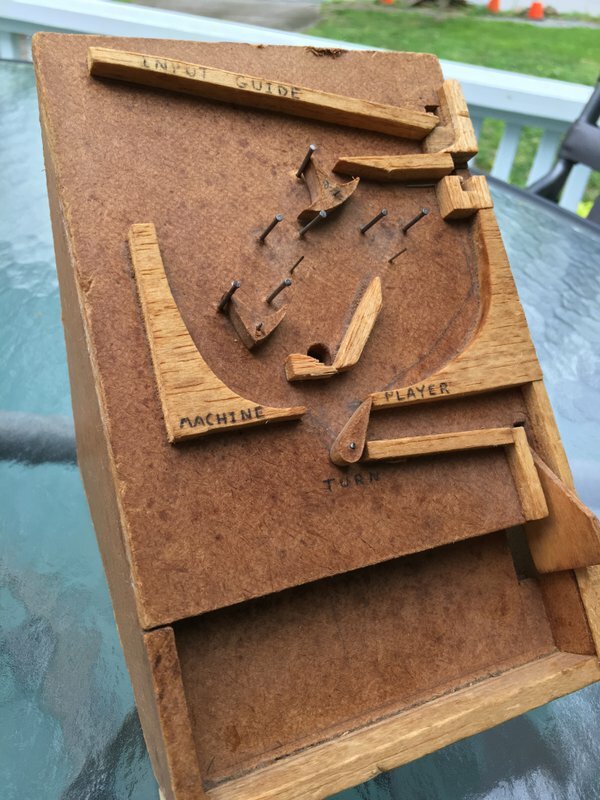 It holds the playfield at an even 30° from horizontal, such that the top sits about 12 ½ inches above your desk top— a particularly good angle for viewing the playfield. 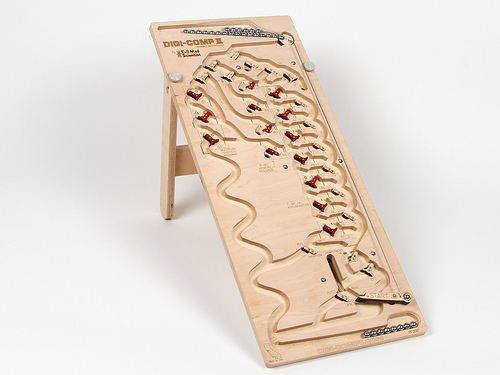 The stand is actually reversible, so that you turn it the other way and raise the playfield only about 20° from horizontal, giving the option of a slower speed of operation. If you want to go faster instead, you can overclock the Digi-Comp II by putting a book below the stand to increase the angle. The new ball release mechanism has been fine-tuned and greatly simplified. We recently showed off a little video demonstrating how this part of the machine works. 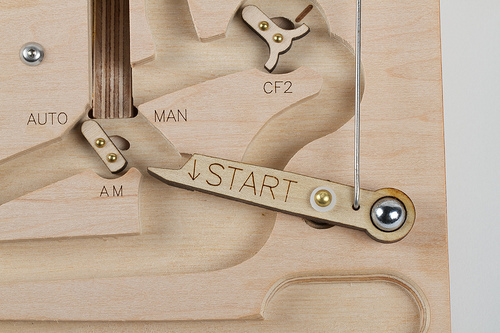 The start lever— now nicely labeled —is made of laser-cut poplar, has a brass rivet as its bearing and a glued-in pachinko ball as a counterweight. When pulled down by a human or a rolling ball, it pushes a stainless steel rod that moves the ball release at the top of the machine to release the next ball. Finally, it’s worth noting that this is called the “Digi-Comp II: First Edition” for a reason: We are planning others. 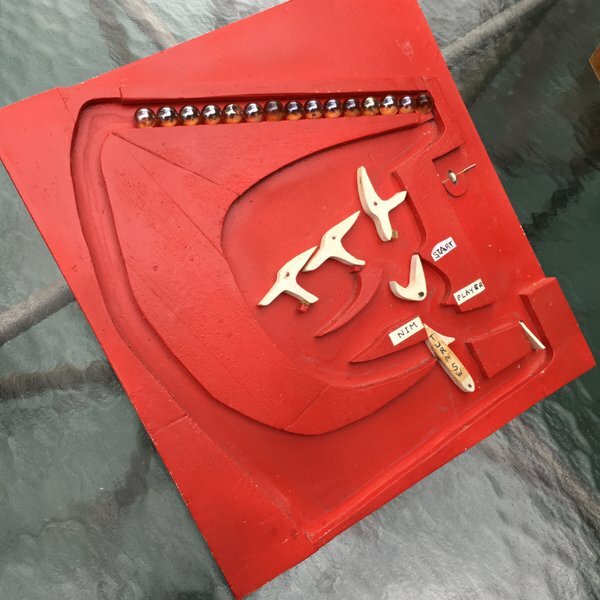 The original 1960’s Digi-Comp II kit was made of thin vacuum-formed plastic (what we more often refer to as “coffee drink lid material”), supported by a sheet of masonite and fitted with injection-molded flip-flops and switches. Our CNC-cut wooden versions are much more substantial, but also cost a lot more to make, both in terms of raw materials and fabrication time. We’ve been slowly working towards what we hope will be a happy medium: a Digi-Comp II made of (more substantial) vacuum-formed plastic, reasonably sturdy, and at a more modest cost. We still plan to release a version like that, hopefully within the next year. This has been a long journey for us— making wonderful machines mostly because they are wonderful machines —and we’re very happy to release our first one into the world. 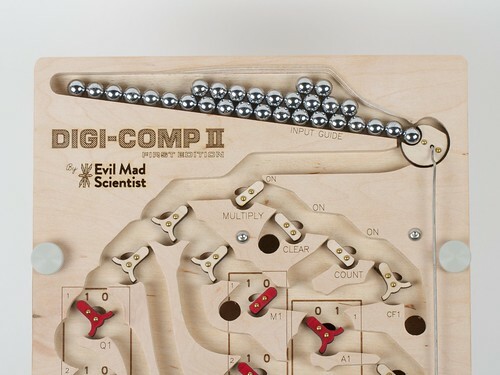 The Digi-Comp II: First Edition is now available to order at the Evil Mad Scientist Shop. This entry was posted in CNC, EMSL Projects, Evil Mad Scientist Shop, Mathematics and tagged digi-comp II, math. Bookmark the Permalink. Maker Faire is (almost) here! The 2012 Bay Area Maker Faire will take place May 19 and 20— just 9 days away — in San Mateo, California. This is the big Maker Faire, and the best. If you’ve never been to Maker Faire, or if you’ve only been to one of the little ones, it’s an experience not to be missed. Today (Wednesday, May 9) is the last day to buy advance discount tickets for Maker Faire. If you don’t have your tickets yet, this is a great time to get them. 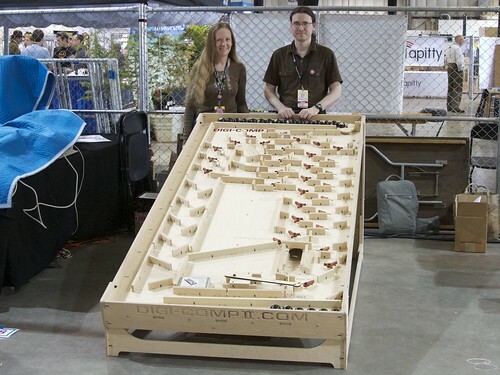 This year we will again be bringing the Giant Digi-Comp II— our supersized binary digital mechanical computer —to Maker Faire. You can read all about the Giant Digi-Comp II here and see a video demonstration of it here. We will also be doing an Egg-Bot demonstration in the Maker Shed. Finally, we’ll also be participating in Maker Faire Education Day (Thursday, May 17, for K-12 students). This entry was posted in Eggbot, EMSL Projects, Field Trips and tagged digi-comp II, eggbot, makerfaire. Bookmark the Permalink.